To administer the Public Service Registry, select Interoperability > Configure > Public-Service Registry. The Public Service Registry is protected by row-level security; consequently, you must have the %EnsRole_RegistryManager role in order to access the Public Service Registry. To administer the External Service Registry, select Interoperability > Configure > External-Service Registry. Business PartnerProvides a link to the business partner object, which provides contact information such as address and phone numbers. Note that the public API only provides the business partner name and does not include any of the contact information from the business partner object. FilenameProvides the name of the file. The name of the file in the registry does not have to be the same as the name of the original file on your local file system or on the InterSystems IRIS™ server. This check box controls whether the information about this service is available through the Registry’s public API. If Public is true (the box is checked) then the API returns information about this service if the user is authorized to see it based on the Required Roles setting. If Public is false, no information about this service is returned by the public API. Required Roles specifies a list of roles that provide public API access to the registry entry. In order for a user to retrieve information about a registry entry, the user must have one of the roles listed in Required Roles. The user may have this role by either being logged into InterSystems IRIS or by using a web application with this role. See “Defining Roles and Users for the Public Service Registry” for details on how to define these roles. Instance identifies the InterSystems IRIS instance that is providing the service at the specified endpoint. 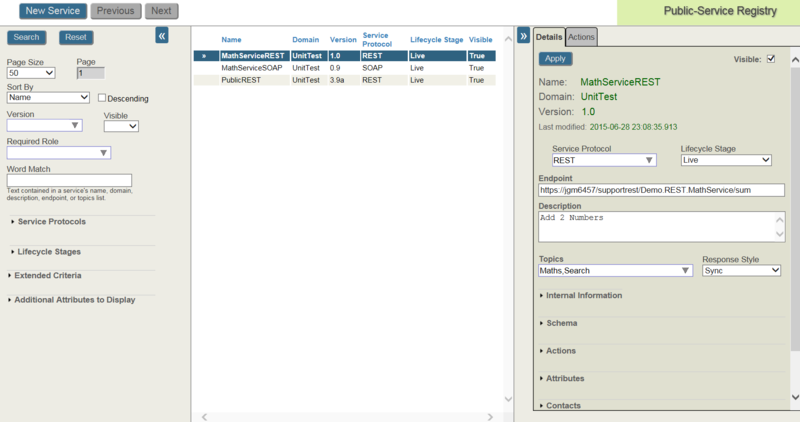 Typically, this is the InterSystems IRIS instance used for the ESB and service registries. In cases where the endpoint service is not provided by a business service, leave this field blank. Namespace identifies the interoperability-enabled namespace that is providing the service at the specified endpoint. Typically, this is the interoperability-enabled namespace used for the ESB and service registries. In cases where the endpoint service is not provided by a business service, leave this field blank. Production identifies the production that is providing the service at the specified endpoint. Typically, this is the ESB production. In cases where the endpoint service is not provided by a business service, leave this field blank. ConfigName identifies the production configuration item that is providing the service at the specified endpoint. Typically, this is configuration item is a business service in the ESB production. In cases where the endpoint service is not provided by a business service, leave this field blank. 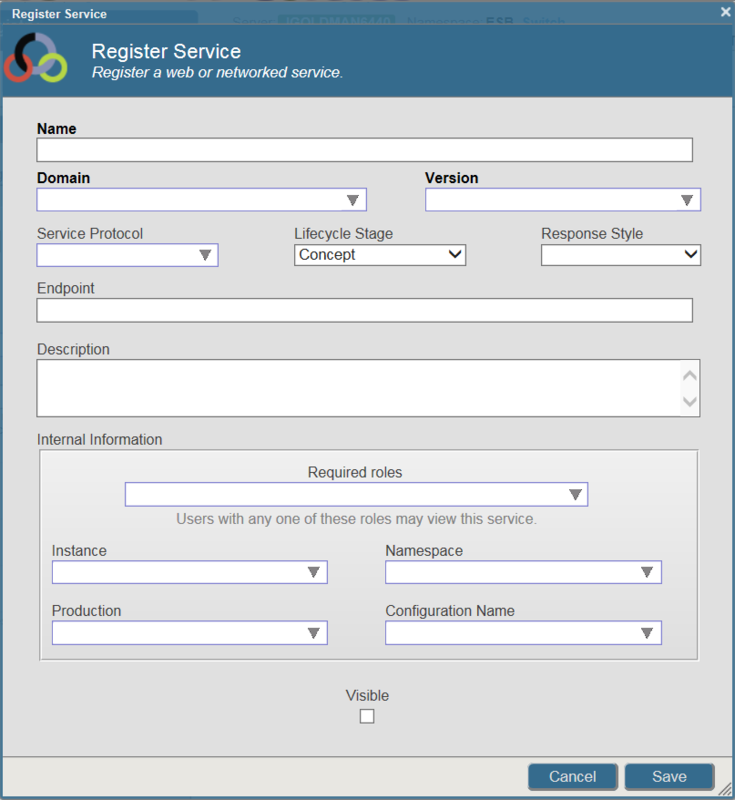 If you create a new service entry in the External Service Registry, InterSystems IRIS displays a similar form that omits the Internal Information fields and the Visible field.